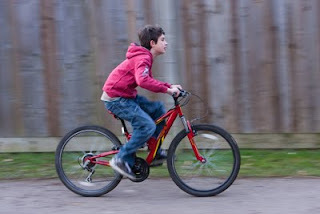 In this exercise we are asked to take pictures using a panning technique on a moving subject at varying shutter speeds. This is a technique I have used many times when photographing motor sport. 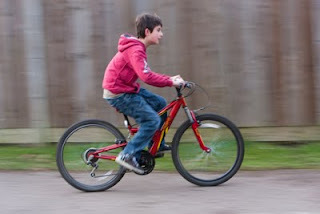 However as my son is too young for a motor bike his push bike had to do. The first picture below was take at 1/60 sec and shows the rider in good focus with the fencing nicely blurred and the wheels also showing a good motion blur. The next photograph was taken at 1/30 sec. Again the subject is in good focus but not quite as sharp as the previous shot, though I do not think the rider was pedalling, if he was the pedals would show more blurring. The background is more noticeably blurred given a greater sense of motion. My preference is probably the 1/60 shot. However it does demonstrate that the slower the moving subject the slower the shutter speed needs to be to get a real blurred background. This may cause problems at longer focal lengths where motion blur may become confused with camera blur. These shots were taken with a focal length of 100mm, using greater than 200mm would require a very steady panning hand to maintain a reasonable level of focus on the moving object at 1/30 sec.